Private lessons of 55-60 minutes are held once a week. We begin with a warm-up and technique session. The student is then guided through performance repertoire, designed for his or her individual growth. With a large lending library, the choices are great! Occasionally, additional repertoire will be suggested for the student to purchase as needed. The Lesson Contract consists of a full month of weekly lessons. The fee for these hour-long lessons is $70. Lesson Cancellations: Advance notice required. Of course, in the event of a sudden illness, the absence will be excused. If cancellations occur, then make-up lessons need to happen within a 2 weeks period. Students are expected to participate in the annual student recital. There are also other exciting performance opportunities. The students are expected to attend occasional Master-Classes. Such classes provide oppor-tunities for the students to perform in front of the class with helpful commentaries by the teacher. I've studied for over a year with Ms. Chowning and I'm so surprised with my rapid progress. I started from scratch with her and I never thought I'd now be looking at a career as a real possibility! 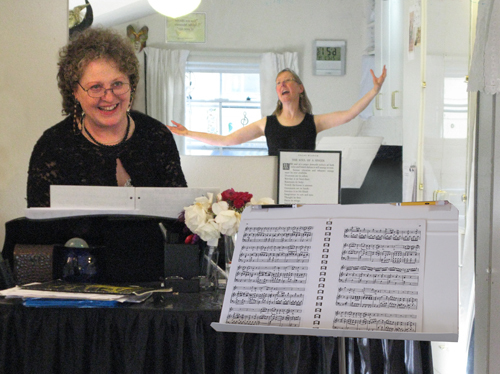 Susan D.
As far as is known, the art and science of vocal pedagogy began in the Catholic Churches of Spain in the 14th century, spread to Italy, and evolved by the early 17th century into a style of singing known as “Bel Canto”. It is not commonly known that Bel Canto, “beautiful singing”, is a very specific vocal technique. 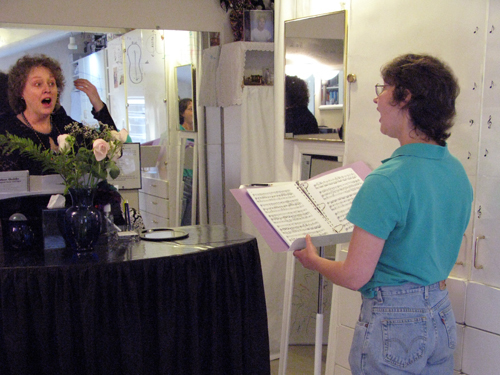 Schools were dedicated to developing the Bel Canto technique carried out by master vocal teachers, while many of whom often maintained successful composing and singing careers. These early teachers were as interested in the study of voice production, the vocal apparatus and its natural physical behavior as they were in music and artful singing. They wrote their findings in treatises, which found their way to the libraries throughout Europe. With the use of computers and other advanced research tools, researchers are discovering that a surprisingly large amount of the Bel Canto theory is supported by contemporary science. I believe in the importance of such ongoing research to vocal teaching, as it informs and guides the development and application of Bel Canto technique today and its ultimate benefit for all my students.